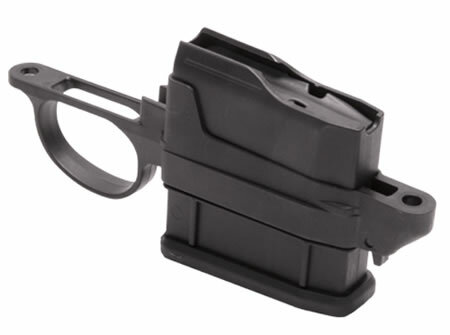 Howa rifles have the ability to be converted to accept detachable magazines in 5 round or 10 round capacities. Conversion can be made in a matter of minutes at home, or by your favorite gunsmith. Instructions are included with each Detachable Magazine kit. Extra magazines are sold separately. The short action magazines are available to fit .204, .223, .243, 7mm-08 and .308 calibers and can be added to older model Howa's, Weatherby Vanguards, Mossberg 1500's, Smith & Wesson 1500's and Inter arms 1500's. New, long action magazine kits and spare magazines are be available to fit Howa and the older models listed above, in .25-06, .270, .30-06 and 6.5 x 55 Calibers.